This tutorial was written using Hash Suite 3.4 Pro and assumes basic knowledge of password hashing and password hash cracking. Hash Suite, like all other password hash crackers, does not try to "invert" the hash to obtain the password (which might be impossible). It follows the same procedure used by authentication: it generates different candidate passwords (keys), hashes them and compares the computed hashes with the stored hashes. This approach works because users generally select passwords that are easy to remember, and as a side-effect these passwords are typically easy to crack. Another reason why this approach is so very effective is that Windows uses password hash functions that are very fast to compute, especially in an attack (for each given candidate password). More information about password cracking can be found here. 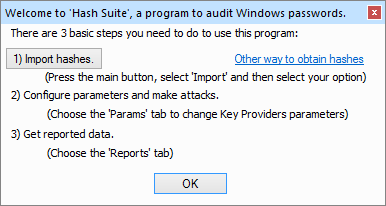 Hash Suite also supports rules that can be applied to all key-providers. Rules are common transformations to base words that many users make to form passwords (for example, the word "love" might result in a password of "Love12"). When the download completes unzip the file and execute Hash_Suite_64.exe (this executes the 64 bits version that is faster than the 32 bits). The Welcome dialog (fig 1) appears at first run with some basic information. Press Enter or click the OK button to dismiss. Let’s do some preparations before we begin to crack passwords. 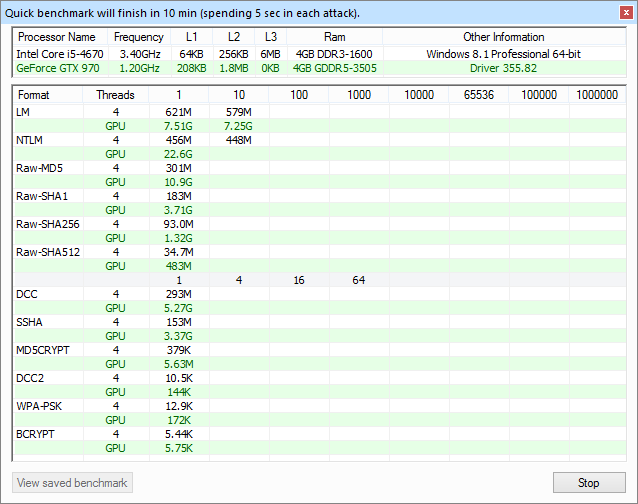 First we will run a benchmark to know our hardware performance. Press alt+f+b to run a quick benchmark (fig 2). Hash Suite uses a ribbon interface that supports hierarchical keyboard shortcuts. We will use these shortcuts heavily in the tutorial. Fig 2: Benchmark on tutorial hardware. The benchmark lasts ~12 minutes (and you may stop it whenever you want) on our system composed of one CPU (Core i5-4670) with a high-end gaming GPU (GeForce GTX 970). Hash Suite automatically selects Threads=3 (of 4), which means we dedicate 3 CPU cores to hashing and 1 CPU core to GPU communication. This is the best setting for our hardware. You may need to manually configure Threads by pressing alt+h+t (fig 3) to obtain the best performance when CPU and GPU are used concurrently. If the GPUs performance is orders of magnitude higher than the CPU's, reduce Threads by the number of GPUs (our case). If using an integrated GPU from Intel, put Threads to the maximum value (Logical cores). In other cases experiment with values ranging from the maximum value to 0. 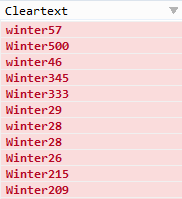 Next we need to obtain some big/quality wordlist. Press alt+d+h to open Hash Suite Downloader and select some wordlist(s) to download (fig 4) (Tip: In Hash Suite, pressing F1 shows a context sensitive help, so if you do not know how to do something simply press F1 and read the documentation). 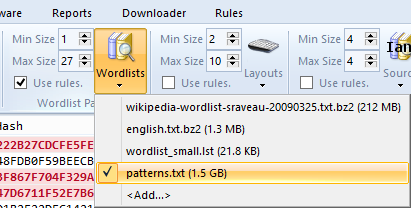 We will download and use in the tutorial the wordlist wikipedia-wordlist-sraveau-20090325.txt.bz2 that contains words taken from Wikipedia. Fig 4: Select good wordlists to download. To crack hashes we first need to obtain them. 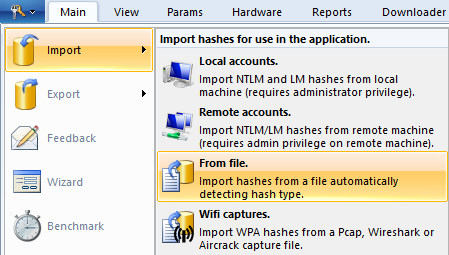 Normally you obtain the hashes from a local/remote machine; however, in this tutorial we will use hashes from password cracking contest Crack Me If You Can 2010 (available from here). These are publicly available hashes of realistic yet artificial passwords (so anyone can access them without concerns), and many of the hashes are of types used on Windows systems (and thus are supported by Hash Suite). The contest lasted 48 hours, which corresponds to a reasonable effort for us to spend as well, and in the end we can compare our results with those of contest participants. First import the hashes (alt+f+i) (fig 5). Fig 5: Import hashes. You will import 3380 LM, 30640 NTLM, 326 raw SHA1, 10582 SSHA, 4716 MD5CRYPT, 80 BCRYPT hashes (fig 6), excluding possible duplicate hashes (resulting from the same passwords seen more than once). In this tutorial we will focus on LM and NTLM hashes and superficially consider SSHA and MD5CRYPT. 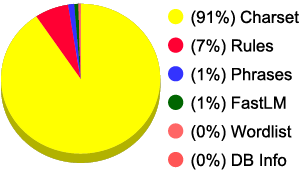 Fig 6: Statistics of imported hashes. Let's begin our 2 days cracking quest. LM hashes were introduced in earlier versions of Windows and support for them continued in later versions for backwards compatibility, even though they were recommended by Microsoft to be turned off. As of Windows Vista, the protocol is disabled by default, but continues to be used by some non-Microsoft CIFS implementations. These hashes were very weak: we can crack ANY valid LM hash password within hours by brute-force (additional information regarding LM hashes may be found here). We will use the Charset key-provider, which is the default option (fig 7), and a range of password lengths from 0 to 6, which is also the default. (You can see parameters on the left panel or by pressing alt+p.) So we only need to start the attack by pressing alt+1 or clicking the Start button (we can pause/stop any attack by pressing alt+2 or clicking the Stop button). Fig 8: Common passwords of length 7. 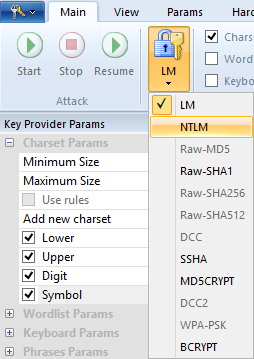 We then increase the password length to the maximum value for LM hashes: 7 and deselect the Symbol characters (fig 8). This will use only Upper and Digit characters, and will find common passwords first. Note that Hash Suite is smart enough not to use lower-case characters (which the LM hash algorithm would have converted to upper-case anyway) even if selected. 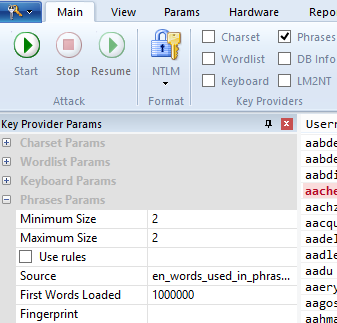 Finally, brute-force all the remaining LM hash passwords by selecting Symbol and then starting the attack with alt+1. Voilà, we found all LM hash passwords in half an hour. NTLM is the successor of LM. It was introduced in Windows NT and it is still in use. First, select the NTLM hashes with alt+m+f (fig 9). Then, infer the case of characters of our cracked LM hash passwords: select the LM2NT key-provider (fig 10) and start the attack (alt+1), which should complete instantly. Fig 9: Select NTLM hashes. Fig 10: Convert LM passwords to NTLM correcting the case. Fig 12: DB Info selected. We begin with some quick (and productive) tests. Select Keyboard, keeping other options at their defaults (fig 11). Now use DB Info with default options (fig 12). Since this is a very quick check, we will use this key-provider from time to time whenever we've found some new passwords by other means. Use Wordlist (fig 13) with the file wikipedia-wordlist-sraveau-20090325.txt.bz2 (the file we began to download at the preparing stage) as input. Note that the attack start is delayed some seconds while Hash Suite is compiling and optimizing rules for the GPU. We will use the Charset (fig 14) key-provider with default options, which are: password length from 0 to 6 with all printable characters. Note that our password length settings were reset when switching to the NTLM format. The popularity of passwords based on phrases has risen lately. 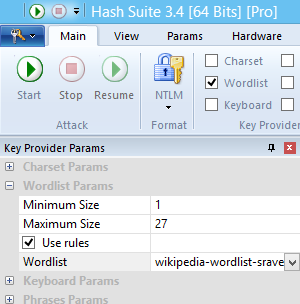 Hash Suite provides a phrase generator with English words. Now let's use Phrases (fig 15) of 2 words with the most used English words. Fig 15: Phrases of 2 words with most used English words. Fig 16: Phrases of 3 words with the 8000 most used words. Use Phrases (fig 16) of 3 words with the 8000 most used English words. Use Phrases of 4 words with the 800 most used English words. In this case Phrases do not crack a good number of passwords, so we give up with this source of words. Fingerprint decompiles passwords into all possible parts or patterns ordered by use. Then you recombine them with Phrases creating common patterns many humans will choose. This is a powerful and simple attack to try apparently complicated passwords. Hash Suite provides a file with many common patterns ready to use. 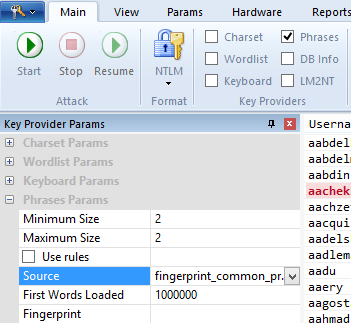 Just choose the file fingerprint_common_pro.txt and use Phrases of 2 patterns and one million maximum words to load (fig 17). Fig 17: Combination of 2 common patterns. Fig 18: Phrases of 3 words with the 8000 most used words. Use Phrases of 3 patterns with the 8000 most used patterns. Once you have enough found passwords you may try to find patterns in them to launch a more specific fingerprint attack. alt+p+f (fig 18) generate a fingerprint.txt file with patterns from the found passwords. Click Yes to begin the attack. Note that you can repeat this procedure again. Given that 2061 new passwords were found, new patterns will be generated resulting in more passwords found. Let's do the fingerprint again (alt+p+f) to test this. Given that 852 new passwords were found, let's do it again (alt+p+f). Given that not so many new passwords were found let's try another idea. Let's once again use Phrases of 3 patterns with the 8000 most used patterns. Given that some new passwords were found, let's do fingerprint again (alt+p+f). To see just how powerful fingerprint is, note that we almost double the found passwords with it in 10 minutes. And it is an almost automatic methodology. We finish our quick tests and move on to more time-consuming attacks. The most productive of these is Wordlist with a good wordlist (large, yet with common words) and rules enabled. Select the Wordlist (fig 13) key-provider and go to the rules tab (alt+u or simply use the left panel) to use more intensive rules. Select the Less Common Rules (fig 19), which you can easily do by inverting the selection with alt+u+i. Note that if you try to stop this attack you may need to wait some minutes before the attack actually stops. This is caused by an optimization and happens only when using Rules on the GPU with SLOW rules enabled (like Word+3chars and 3chars+Word). In any other case the attack stops almost immediately. Fig 19: Uncommon rules enabled. Let's try Charset (fig 14) with password length 7 and all printable characters. Fig 20: One common pattern. Fig 21: Use the generated pattern wordlist. We can create a program or script to generate a wordlist with these patterns and then use it in Hash Suite. We choose to make a simple C++ program. This program generates a wordlist named patterns.txt with a size of 1.5GB that we can load in Hash Suite with alt+p+w (fig 21) (or with the left side panel). 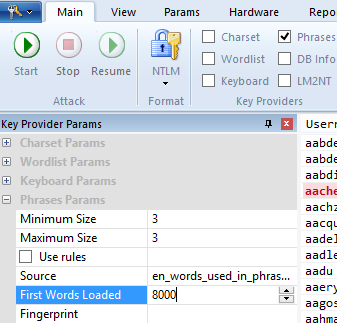 Then we select the Wordlist key-provider (fig 13) and select all rules (alt+u+m) except Word+3chars and 3chars+Word. There is also an easy pattern of person names with leetspeak transformation. We can exploit it by downloading the wordlist facebook-names-unique.txt.bz2 and applying leet rules. We leave this pattern for readers of this tutorial to explore on their own. Let's make a quick stop at SSHA and MD5CRYPT hashes and how to crack them, given that there are some differences with the hash types we tried cracking so far. These are salted hashes, meaning an expected-unique value (normally random and called salt) is added to the hash computation. This causes the need to test each key for each different salt, effectively reducing the performance of the attack by the number of salts used. Note that performance of attack on one salted hash is similar to that of attack on a non-salted hash; it's only when many hashes are attacked the use of salts strengthens the security of hashes. What this means is that we need to use more efficient/intelligent methods to attack salted hashes. Let's begin with SSHA and a Wordlist key-provider (fig 13) without rules enabled. We will try all our wordlists sorted by size. Begin with wordlist_small.lst. Let's try DB Info key-provider without rules enabled. Let's finish with Phrases key-provider without rules enabled. 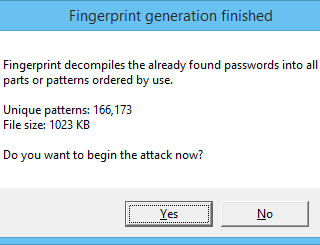 Use a fingerprint attack with 2 patterns from source fingerprint_common_pro.txt and the 7000 most used patterns. Use a fingerprint attack (alt+p+f and select no) with 2 patterns from source fingerprint.txt and the 7000 most used patterns. Let's move to MD5CRYPT and use the same strategy as we did with SSHA. Begin with a Wordlist key-provider (fig 13) without rules enabled. We will try all our wordlists sorted by size. First is wordlist_small.lst. We don't use wikipedia-wordlist-sraveau-20090325.txt.bz2 as it is very large for the performance of the attack with this number of MD5CRYPT hashes. Let's try DB Info key-provider without rules enabled. Let's finish with Phrases key-provider without rules enabled. Use a fingerprint attack with 2 patterns from source fingerprint_common_pro.txt and the 650 most used patterns. Use a fingerprint attack (alt+p+f and select no) with 2 patterns from source fingerprint.txt and the 650 most used patterns. With this we finish our quick tour of salted hashes and how to approach them. We go back to NTLM hashes for the rest of the tutorial. 2 The percent of passwords that will be found if you use Charset Length most used characters as a charset. For example with the 65 most used characters we expect (as this is based on already found passwords) to cover 59% of the passwords. Hash Suite calculates this metric for you (press alt+p+a and enter the number of characters). 3 Use the Hashes_Found report (alt+r) to obtain it. Add a new charset with the 75 most used characters: press alt+p+a and enter 75 as the Number of characters (fig 22). 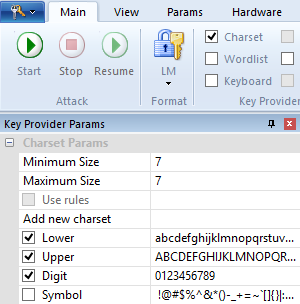 Start a Charset attack (fig 14) with password length 8 and the 75 most used characters as charset (fig 23). 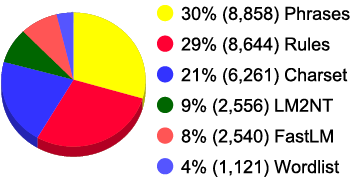 Fig 22: 75 most used characters. Fig 23: Params for 75 most used characters. Add a new charset with the 44 most used characters (alt+p+a and enter 44 as the Number of characters). Start a Charset attack (fig 14) with password length 9 and the 44 most used characters as charset. Stop the attack when you approach 12 and a half hours of cracking time. Finish our cracking with DB Info (fig 13) with all rules enables (alt+u+m). In our 2 day cracking quest we found 79% of all passwords. In a real environment we expect more than 90%, but this is a contest. How good is this? We crack 2360 LM, 24576 NTLM, 1618 SSHA, and 924 MD5CRYPT hash passwords (alt+v+s and see Matches; the difference is because there are some accounts that share the same password). We score 29478 and would end up 4th of the 18 teams that participated in the contest. Note that we focus on only 2 types of hashes (LM and NTLM; SSHA and MD5CRYPT were only superficially touched) out of the 8 types given by the contest organizers, and we only had one PC system, whereas high-scored teams had multiple members and used multiple machines. On the other hand, Hash Suite 3.4 and the GTX 970 graphics card were not yet available in 2010 (when the contest occurred). Cracking passwords may be fun, but each cracked password is a weak password that represents a security risk. Hash Suite Pro can help to mitigate this risk disabling the account or forcing the user to change the weak password, with alt+f+a (fig 24). This only works when you import the accounts from a local/remote machine (not from a file). Fig 24: Fixing weak accounts. Hash Suite Pro Reports (alt+r) help you with the analysis of the data you obtain. Below are some graphs from the reports Attacks and Hashes_Found. Fig 25: Time by Key-Provider. Fig 26: Guesses by Key-Provider. Phrases and Rules (with Wordlist and DB Info) are the most productive key-providers with 59% of found password and only 8% of time consumed. Fig 27: Passwords cracked by Time. In the first hours we can expect to crack 3/4 of all passwords found. Fig 28: Passwords cracked by Length. Users normally select passwords with less than 10 characters that are easily crackable. Hash Suite is a very fast and simple (yet powerful) password cracker that can help keep your organization users' passwords safe. We hope that with this tutorial Hash Suite use will be simpler to a broad number of customers.